Life quieted down this week when my family from Texas had to go back home. But before they did, we took them out for one more walk out on the lake. There was ice fishing people hanging out out there so we thought we'd go check out what they were up to and if they wanted to make friends with us. Not many of them seemed all that interested. The dogs were excited to get some fresh air. Even though their Texas feet had some challenges dealing with the snow and ice for too long. Lucky Dave was there to help them get through the ordeal. For 6 nights, the cousins did a great job of getting along with one another. But even they were getting a little bit tired of dealing with each other's attitudes. Avery just mainly sticks by his dad's side which is probably for the best. We tried to get Lauren to defect from Texas and move to Minnesota to stick by Sheri's side, but she declined. This is my brother-in-law, David, and my other brother-in-law, David. I can never remember which one is which. On the walk back home, we discovered somebody had been getting creative drawing in the snow. I'm hoping this is just a really poor attempt at drawing a bicycle. On New Year's Eve, we had a grand old time bringing in the new year with our old friends the Zitzewitz Family and a bunch of their family and other friends. It's a good crew to celebrate with. 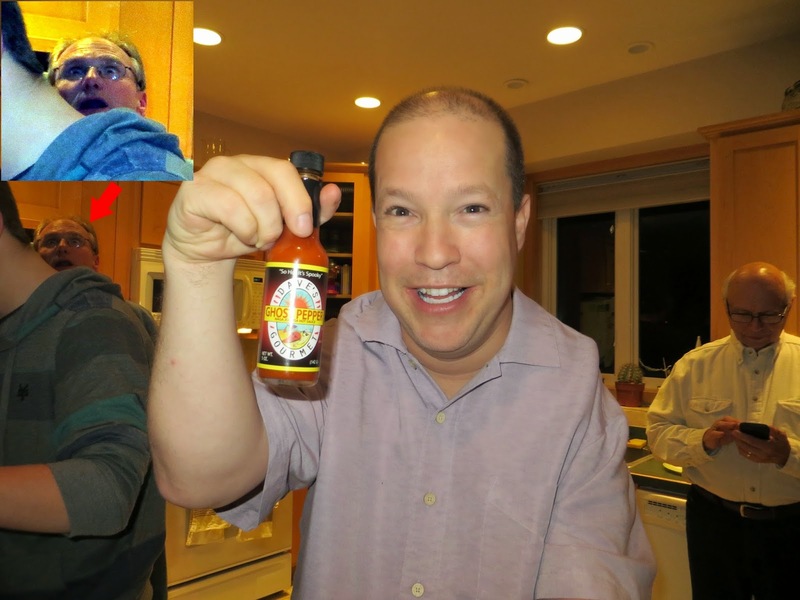 Troy Brown brought some ghost pepper sauce to try on some of the wings and ribs we had for the evening. It was a horribly unpleasant experience that lasted a lot longer than I imagined it would. This is a picture of me shortly before I took my first bite. I noticed Troy in the background of this shot and surmised he had taken his first bite shortly before this.